(CNN) - It's the same Oval Office. The same desk. Even the same curtains. But President Obama has already made one major change: Go through eight years of White House photos, and you won't find one of former President Bush in the Oval Office without his jacket on. It wasn't just a personal preference. In the Bush administration, it was a rule: Jackets in the Oval Office - and now, it seems, one of the first Bush-era regulations to get scrapped in the Obama White House. 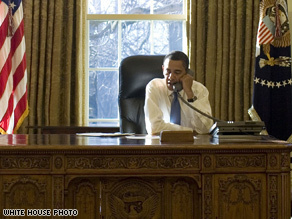 Mr. Obama is trying to get to work immediately to rebuild America. When he meets with dignitaries he will don the jacket . Please do your part to aid our president. That is the most powerful room in the world. It is a place to be respected, not hang out in. Consider it symbolic, but it was a constant reminder of the size of the task it is to lead the greatest nation on earth. Bush and Reagan got it right!! !